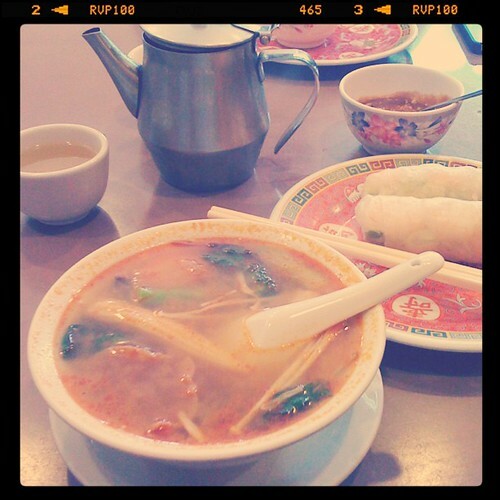 One of the first places RJ ever took me to eat was a brilliant little Asian hole-in-the-wall in Marrickville called Old Thanh Huong. That original visit was over 10 years ago now and he had discovered it years earlier than that when his sister lived around the corner. Ever since it has been a stand-by of ours. The food is fantastic, the tea is complimentary and the staff greet us like long lost family members each time we visit, how can you go wrong?! The menu is the size of a novel yet we’ve only looked at it probably twice… our order is the same every time – two serves of Prawn Rice Paper Rolls and a small Tom Yum Vegetable, thanks. Sometimes a Stir-fry Garlic Chicken appears for RJ and Salt and Pepper Squid used to be a regular go-to dish but it’s an occasional treat rather than a common occurrence these days! 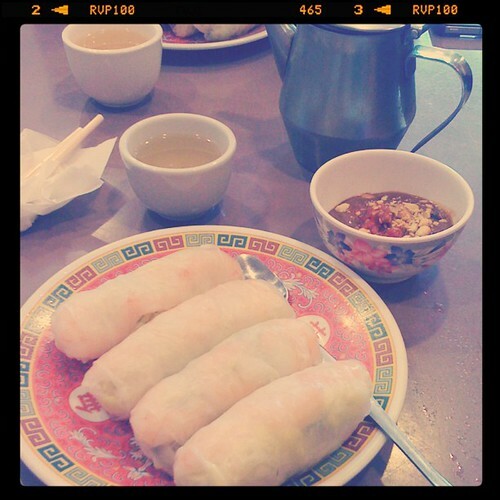 When we lived in NYC one of the things we missed most was the Rice Paper Rolls – I know, one of the biggest cities in the world and a foodie haven and we couldn’t find a single one we rated. Needless to say I got really good at making them. These days with Marrickville only a short drive away we don’t make them too much anymore but when brainstorming what to use some lovely Pawpaw and Papaya for they popped into my head immediately. [Warning, severe direction change ahead…] A few years ago RJ and I decided that a holiday was needed urgently. 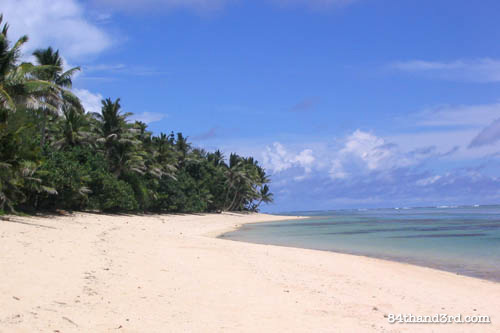 RJ got planning and before you knew it we were off to Roatunga in the Cook Islands for New Years. We stayed at a tiny resort with 15 little cottages and arriving late at night were led down the winding path and into our personal villa. 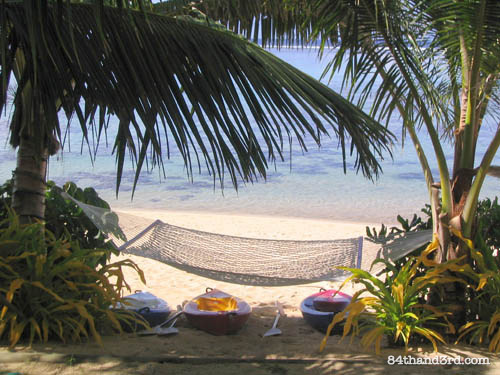 Little did we know what was waiting for us just on the other side of the darkness… The next morning we awoke to a breathtaking view – front veranda, foot path, hammock strung between two palm trees and then the beach – bliss just a few short steps away. Cuing the usual holiday negotiation dance, I immediately declared that I would be doing little aside from reading and basking in the sun for four days while RJ immediately started the campaign to make me swim-snorkle-ride-on-moped-go-exploring-see-stuff with him. The first day I waved at him from the beach, occasionally dipping into the water just long enough to cool down. By day two we were snorkeling between naps on the sand. Come day three and four we split the difference relaxing in the morning and taking off on a moped to explore each afternoon. We’re pretty good at this vacation caper. Each morning a fresh fruit basket would arrive at our door. 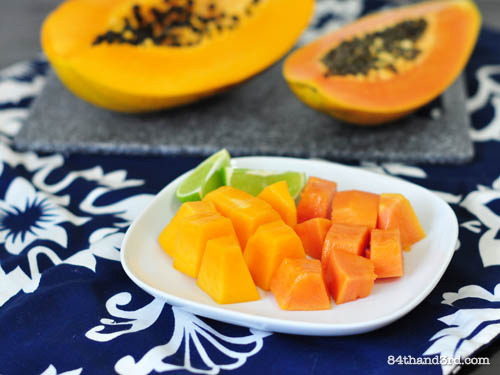 It was full of tropical delights including enormous wedges of Pawpaw – or was it Papaya? – and lime. 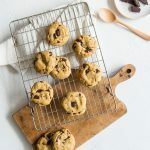 Even though I’ve since been eating both for years – simply cut up and dosed with a healthy squeeze of lime juice – I couldn’t have told you the difference between them until just a few weeks ago! As happens occasionally, a lovely bag of treats showed up at my door and I was finally able to taste these two fruits side by side. Oh, right, I made a video… sort of… about how I roll rice paper rolls. Hope you enjoy. Anyway, these came out just as I had hoped, injected a healthy dose of summer and reminiscence into into a freezing cold winder day, and I still have a stash of the Red Papaya in the freezer for a future tropical smoothie! 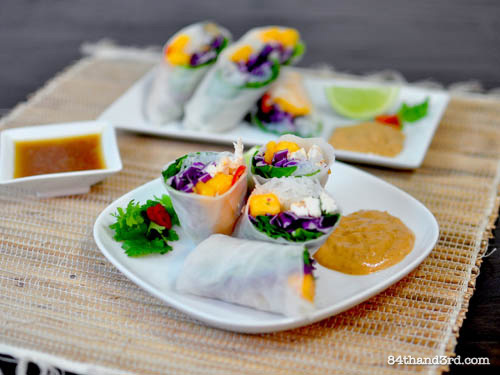 So tell me, do you like pawpaw and papaya and have you ever made rice paper rolls at home? Soften noodles in boiling water and drain. Soften a rice paper round, place on towel and layer ingredients. Roll. 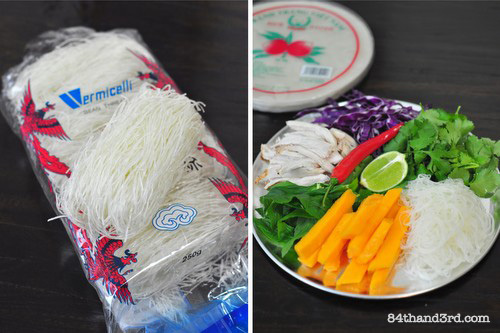 Pour boiling water over one section from a pack of vermicelli noodles and let sit 5 minutes. Drain and divide into 8 portions on a piece of paper-towel. Pick 2-3 mint leaves and 2-3 sprigs of coriander for each roll. Thinly slice red cabbage and chili. Cut or shred your protein if using. Peel and de-seed pawpaw, cut 16, 1 cm wide, batons. Slide the first rice paper round into cool water for a minute or two to soften – I do this in a saucepan. Remove and place on a double layer of paper towel or a clean tea-towel and then pat top surface dry*. Slide in next round in to soften while you build the roll. A few cms in from the closest edge of the wrapper layer leaves, cabbage, noodles, protein, pawpaw, chili. Fold front edge away from you over filling, fold up left side, roll once away from you, fold up right side, roll up all the way. Makes 8 rolls. 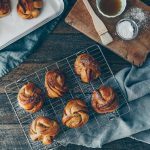 Serve 2-4 rolls per person with Lime and Rice Wine Vinegar Dipping Sauce [recipe below] and Peanut Satay sauce. If I ever manage to create a satay I am happy with I’ll be sure to share the recipe! Whisk together some lime juice, rice wine vinegar, a splash of soy sauce, a drizzle of sesame oil and a drop of honey or pinch of palm sugar. Adjust flavour as necessary. Only submerge rice paper wraps in water just before you intend to use them. If you do more than one at a time the others will absorb too much water and will be difficult to work with. However, I tend to keep an extra rice paper round in the water to rip off pieces and use as an inside patch if necessary. Make sure to gently pat dry the top of the wrapper after you place it on the towel – wet wrappers will not stick as you roll them. These don’t refrigerate particularly well – the wrappers get tough and weird. Eat soon after making. See that platter of ingredients above? 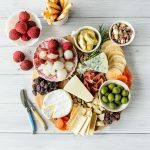 Looks just like a meal in itself doesn’t it… If you can’t be bothered with the rolling, forgo the wrappers and make a salad! In a large bowl combine shredded red cabbage, torn mint, coriander sprigs, and sliced chili. Roughly chop soaked noodles and toss through with diced protein of choice and diced pawpaw. Drizzle over the Lime and Rice Wine Vinegar Dipping Sauce as a dressing. Pretend you are sitting on the beach. Thanks to Papaya Australia and Impact Communications for the tropical fruit delivery! The Aussie-grown Papaya and Pawpaw season peaks in May and then again in September and October. 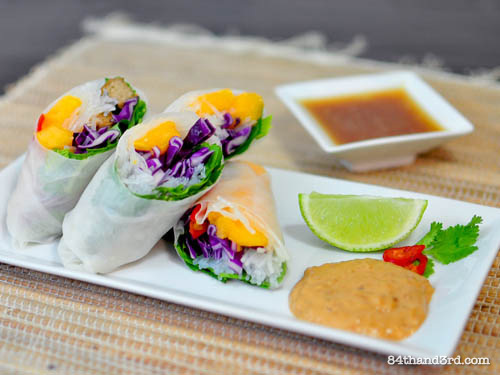 JJ – I too enjoy making rice paper rolls at home. I like the fact I can put whatever I want in them, they are such versatile little morsels. I’ve never tried having fruit in them (bar avocado) before. These look very tasty… If it only it really were Summer! That’s my favourite part! I know, anything to bring on warm thoughts right now! I think they’re almost too pretty to eat! How strange that you couldn’t find any in NY. These are just gorgeous! The colours seriously popped out at me and made me smile! I feel so healthy when I eat papaya. Your photos are wonderful and I will check out your vid when I get home from work! Amazing pictures! 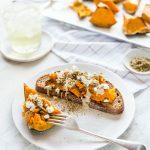 Not a fan of papaya but your presentation is so pretty, I am convinced to give this a try. I can never tell the difference between papaya and paw paw! Nice idea to use them in a rice paper roll too. 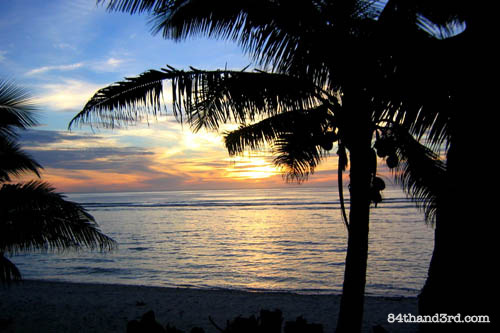 Love the Cook island shots…been longing to go there for a while and chill. Oh my goodness that just looks like a little slice of heaven – both the rolls and your vacation spot!! I don’t think I’ve ever had pawpaw, I’ll have to look for it. And I love your video, thanks!